IDW licensed comics continuously build on what’s been established in a given series, adding and expanding. Yet it’s not every day we find a story that feels as though everything that came before has built up to it. Vengeance, however, is such a story. 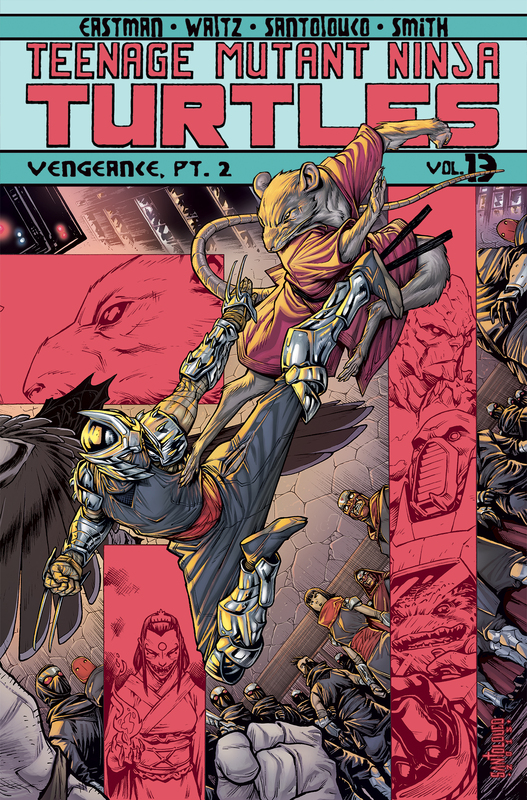 The Vengeance, Part 2 paperback collects issues 48, 49, and 50, which contains the climax of the Turtles’ battle against the Shredder and his Foot Clan and therefore the climax of the ongoing’s story so far, stretching all the way back to issue 1. I’ll give my usual disclaimer here: I’m a TMNT superfan, so your mileage may vary on this book, but this series is a strong, compelling read that I think anyone can enjoy if they start from the beginning. Though it doesn’t feel quite as large as City Fall, the sprawling arc that took place in issues 21-28, there’s a tighter focus that still serves the high stakes, and there are still several threads occurring at once. The stories scripter Tom Waltz and editor Bobby Curnow have crafted with TMNT co-creator Kevin Eastman have always been impressive, and for them to have concocted so many threads for so many characters is impressive. Still, if the scripts drop the ball, none of that matters, but throughout IDW’s TMNT, Tom Waltz has proven himself adept in juggling all of it as schemes unfold, alliances shift, and status quos change. Every story arc is dense with plotlines, and so much happens at once, but nothing feels like too little time has been spent on it. While the focus is on Shredder going all-out against the Turtles and their allies, Waltz performs an adroit balancing act with everything else happening in Vengeance: mutant gang leader Old Hob busts Hun out of a paddy wagon; Karai chafes at the inclusion of Baxter Stockman in the Foot’s vendetta; the Fugitoid and Harold build Donatello an artificial shell and meet an obscured dinosaur mutant; and the immortal Kitsune continues exerting influence over the fox mutant Alopex. The conclusion of Vengeance is a conclusion, but far from the conclusion, as these threads are a promise that the story will continue. TMNT has had a rotating stable of great artists, and Cory Smith and Mateus Santolouco are no exception. Smith’s strengths are manifold. His faces are expressive and his characters act with nuance. One example is a sequence of panels imitating a circular pan around the Turtles, Splinter, Alopex, and Nobody, standing back-to-back in a tight formation, surrounded by Flyborgs. Splinter and Leonardo are alert; Alopex and Raphael bare their teeth in challenge, angry, full of feral rage; Nobody and Donatello, in faceless bodies, raise wrist-mounted guns; and Michaelangelo, though spinning his nunchaku, ready to fight, shows some reluctance and concern. Smith’s Shredder is another example I love: he’s pointy, dangerous, big, and even when he’s just standing or sitting, his muscles are taut. Smith also renders speed and weight with equal skill in action sequences. Whether it’s Alopex dashing in as an indistinct blur or Rocksteady cracking stone ground with his hammer, it all feels right. Santolouco’s art has a visceral quality to it that I’ve always felt fit well for IDW’s TMNT. Here, the differences between his art and Smith’s are subtle but distinct, most pronounced in how they draw the Turtles. Santolouco draws Raphael with rippling, bulgy muscle, where Leonardo is more slimly muscular and Michaelangelo is skinny. Ronda Pattison works equally well with both artists, as she has with every artist on this series, changing the palette to suit the linework. The colors are a bit brighter for Smith’s lines, while in the past, for Santolouco, everything’s been a bit grungier. Shawn Lee still turns in great letters. When Donatello transforms his robot body into a boat, a whirring sound effect loops around his legs like in a 3D space. People scream like nobody’s business with Lee lettering them, such as the uneven red when Shredder bellows “KARAI!” in anger. Vengeance, Part 2 culminates in a rooftop duel where the Turtles and Splinter fight Shredder. It’s an echo of the original Teenage Mutant Ninja Turtles #1, which was the Turtles’ first and supposedly decisive confrontation with Shredder, where Shredder dies. In that original comic, it’s an interesting story, particularly in the context of what Shredder has since become in the overall Turtles mythos, but Shredder isn’t entirely convincing as a viable threat, as we only know his story through flashback. This time, however, the conflict spans centuries, considering the reincarnation storyline, and over 50 issues, the story has earned this ultimately final conflict. Shredder fends off the Turtles easily while Splinter meditates and thinks on his history with Oroku Saki, a man he considered his brother in his previous life. It does well to show the seeds of what Shredder would become, even in his childhood. The Turtles earned their chance to fight Shredder, Splinter earned his, and Shredder, despite his unrepentant villainy, earns the warrior’s death Splinter gives him. The entire panel goes purple as Splinter swipes Leonardo’s sword through Shredder’s neck. The moment has so much emotional weight. And afterwards, Karai offers leadership of the Foot to Splinter, which he accepts, and I absolutely cannot wait to see where that leads. I don’t know how long IDW’s TMNT will last, but it’s still going strong after 50 issues of the main series and a number of extra issues and graphic novels. I can only imagine that the next 50 issues, if that many are on the horizon, will be just as impressive. And I think in the end, this will be hailed as one of the best Nina Turtles continuities ever.